Castercliff Hillfort near Colne and Nelson, Lancashire. OS grid reference:- SD 8849 3839. 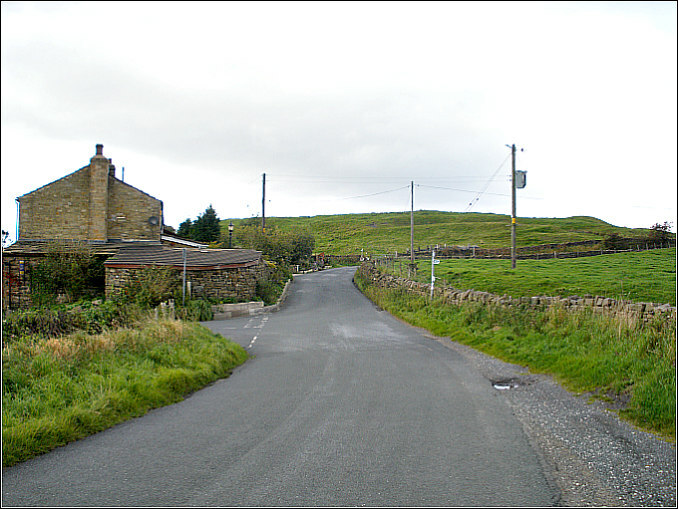 On Southfield Lane above the Lancashire towns of Colne and Nelson, is Castercliff hillfort, an Iron-Age contour and multivallate fort that dominates the landscape and is 900 feet above sea-level. The fort and its defensive ramparts cover a large area of the high ground above the two Lancashire towns and is a well-known landmark in these parts. 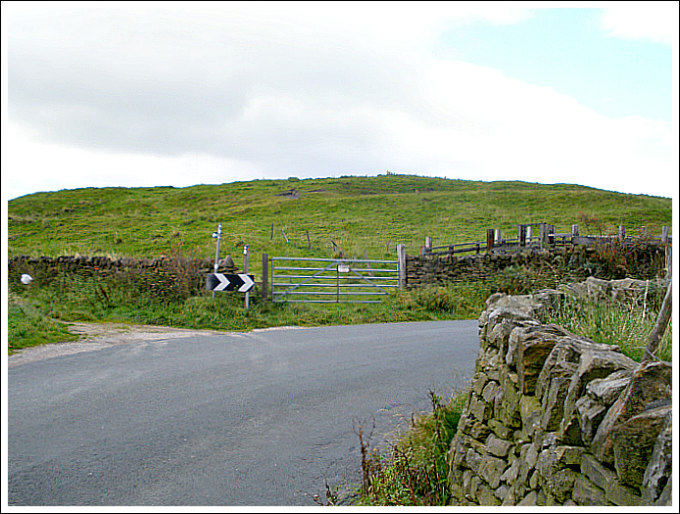 The fort can be reached from Nelson by going up Barkerhouse Road, turning left at the top, then going along Southfield Lane to Gib Clough Head Farm, where just opposite on Back Lane there is a parking area – the hillfort is then reached by a stile and footpath at its eastern side. It was considered by some local historians to have been a ‘temporary’ Roman camp because a number of Roman coins had been found in the vicinity; it could in all probability have been a Romano-British camp or settlement. The sunken lane that traverses the eastern side of the fort was long thought to date from Roman times, but it is nowadays considered to be a Medieval trackway that leads from the high-ground down to the valley of the river Calder. But walking along this grassy, now overgrown track affords some good views of the ramparts at the south-eastern side of the fort. Castercliff hillfort is said to date from approx. 750-500 BC, though some archaeologists now think it is much older. It covers an area of 1.7 hectares – just over 4 acres in total. The fort is described as being oval shaped and originally having three ramparts. It is largerly made of stone with timber lacing. The inner (revetted) rampart shows signs of vitrification due to burning at some stage in its early history – its lifespan being short lived. But whether this was because it was attacked, burned by its own occupants, or just simply abandoned, is not known with any certainty. The oval-shaped plateau is 115m x 76m, while the defensive ramparts are approx. 1.5m high and the inner ditches about the same; the ramparts at the N side are unfinished and only one single rampart and ditch is evident here, but with shorter sections of three ramparts. At the W side there is what appears to be ‘a quite prominent’ entrance into the hillfort. Bell Pit & Pond on Castercliff hillfort. 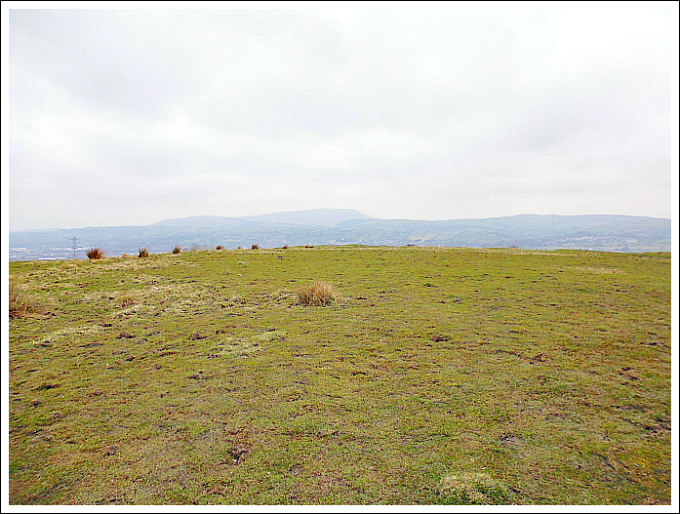 The author John Dixon in his local book ‘Historic Walks Around The Pendle Way’, adds more information on the hillfort and says that: “The inner rampart…..upon excavation, was seen to be partly vitified. Originally it consisted of upright timbers set in two tiers about 6 ft apart and perhaps transverse timbers within the framework. The main bulk of the rampart was constructed of stone and earth and may have had a stone facing. At some time the timbers had been fired and this resulted in the shattering of some of the stones and the vitified masses. Castercliff hillfort is different from its near neighbour Portfield, 9 miles to the south-west near Whalley, in that it is a contour fort, whereas Portfield is a promontory fort; and yet Castercliff’s ramparts seem to be of a wholly different construction. But it is obvious that it had a higher hierarchical status to Portfield. It was, no-doubt, the residence of a chieftain of some high standing. Portfield hillfort has only one, low rampart and is today considered to be more an enclosure and earthwork. 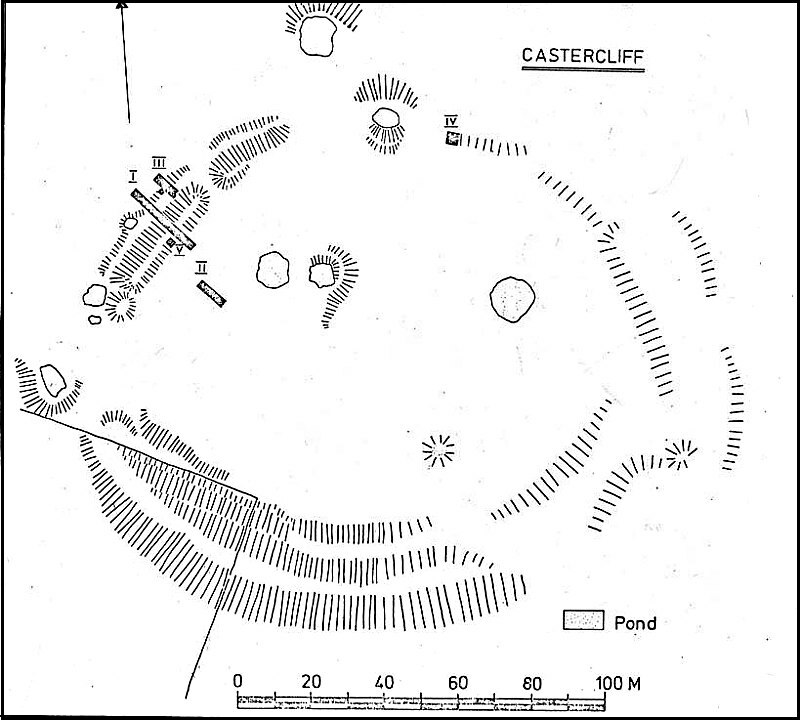 Castercliff Hillfort Plan (After D.G. Coombs). 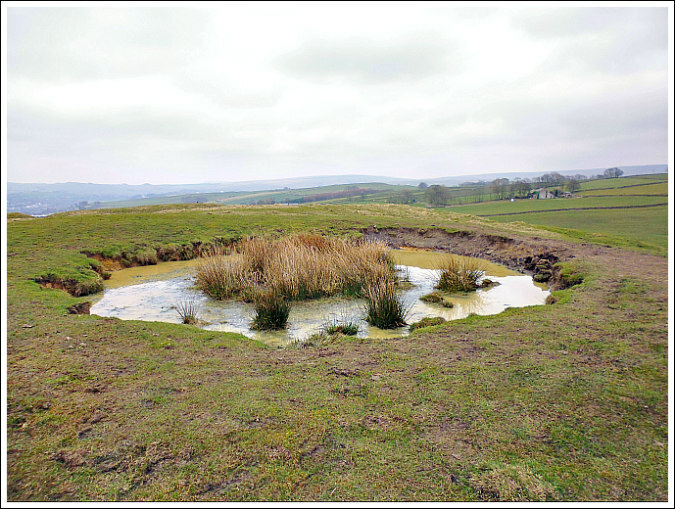 The plateau of Castercliff is pock-marked by numerous bell pits – these circular depressions are evidence to the fact that coal was being extracted from the ground here from as far back as the 16th-17th centuries; some of these pits have become ponds with an array of insect and amphibian life during the Summer months. The late John Dixon told me that there were traces of hut circles in the field just to the north of the fort, but ‘as yet’ I have not been able to find any evidence of them. In 1958-60 and again in 1970-71 Archaeological excavations were carried out on the hillfort. Over the years a number of flints have been dug-up from the site, and a number of Roman coins have been found at the foot of the hill and along the sunken lane. On the top of the hillfort looking towards Pendle. Bennett, W., The History Of Marsden And Nelson, Nelson Corporation, Nelson, Lancashire, 1957. Categories: Hillforts | Tags: Castercliff Hillfort near Colne And Nelson in Lancashire | Permalink.